VW's dieselgate killed any thirst for oil burners. The G-Wagen will not be coming to the U.S. with a diesel-based powerplant, even though it would likely meet all U.S. standards. Even though it has a redesigned diesel that meets tight new European carbon dioxide standards that will take effect in 2020, Mercedes-Benz has no plans to offer a diesel-powered passenger car in the U.S, according to one of the German automakers top executives. Ola Kallenius, the head of research and development for the Mercedes-Benz Car Group, said the new diesel engine the automaker has designed is one of the most advanced internal combustion engines ever developed by the automaker. However, Mercedes has concluded that there simply isn’t enough consumer interest in diesel to warrant bringing it to the U.S. market. “It does much better on emissions for Europe,” Kallenius said during an interview at the North American International Auto Show. Mercedes-Benz is planning to offer a diesel engine in the new G-Wagen that it unveiled ahead of the NAIAS. 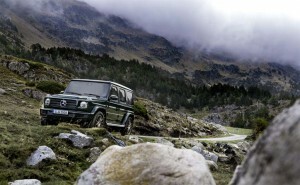 However, the diesel version of the G-Wagen will not be sold in the U.S., Kallenius said. Throughout the years, Mercedes-Benz has offered various models in the U.S. with an optional diesel engine but it stopped selling diesel-powered vehicles in the U.S. after Volkswagen AG was engulfed in the “dieselgate” scandal that began with VW cheating on emission tests. But Kallenius noted diesel-powered vehicles have never accounted for much business for Mercedes-Benz. The sales of the diesel-powered vehicles was limited, accounting for only 3% of the brand’s sales even in their best year, he noted. “The diesel doesn’t fit into our portfolio in the U.S.,” he added. Mercedes-Benz, however, is offering a diesel engine in its Sprinter vans, Kallenius said. Sales of the Mercedes-Benz vans have continued to grow as demand has grown in the transport sector. It appears that e-Commerce with its need for package deliver has helped spur sales,” Kallenius said. Kallenius also said that Mercedes-Benz is capable of building a business case for the 37 different body styles in its product portfolio even as the sport utility vehicles and crossover account for a larger portion of the brands sales. This entry was posted on Thursday, January 18th, 2018 at and is filed under Automakers, Automobiles, Markets, Mercedes, Sales, U.S./North America. You can follow any responses to this entry through the RSS 2.0 feed. Both comments and pings are currently closed. I drove [used] MB diesels from 1983 to 2012, when I had to switch to VW because Mercedes hadn’t bought one here. And I just drove 700 miles round trip to pick up a 2015 Passat (all my diesels have been manual shift, and that’s where a good one was) because the demand was so great near where I live that “reflashed” 2015′s cost the same as brand new well-equipped Passats, which aren’t diesel of course. I also live in Italy, and their new 2.1 L diesel is a wonderful car. Wish they would work to create a market again here. Unfortunately for diesel fans, even in Europe demand has been plunging in the wake of rigged diesel tests and it is a serious question where the technology will settle back to. But fortunately for diesel fans, the engines last so long that diesel passenger cars will still be around long after most of us are gone. We just need to take good care of them, if we want them to last 30 or 40 or 50 years. One thing we do know is that manufacturers will not be able to meet their CO2 targets and Paris Climate committments without the diesel. Reports are already emerging on this point in Europe. The Euro 6 diesels (most but not all) are very clean, as noted here- but government policies in Europe have created disincentives through tax penalties for investing in new and cleaner diesel technology. For those diesel lovers out there in the US, there are other excellent options in this Lux segment – namely Jaguar, Land Rover and BMW (who knows maybe one day a Cadillac) all who stand to benefit from this unfortunate market decision by Mercedes.